Kevin Whittle is a long-time Lotus enthusiast to put it mildly. He has owned and/or competed in nine different types, multiple examples in many cases, and completely restored most of them. He founded and edited Classic Lotus Racer magazine before becoming Lotus 19 Registrar for the Historic Lotus Register which he followed with five years as editor of Historic Lotus magazine. He knows whereof he writes, of that there can be no doubt. This is the fourth volume in his excellent series of books on specific Lotus models, the previous ones having covered the type 35 F2 cars, the 19 sports racers and type 46 Europa S1 and, like these, it is packed with detailed information about the cars themselves at a level which will inform current owners as well as fascinating enthusiasts for the marque and the era in general. It goes without saying that Formula Ford has been – and, in historic racing, still is – probably the most successful and prolific of racing formulae, featuring strongly in the early careers of many, many internationally famous drivers. Moreover, it was a formula which encouraged enterprising small-scale constructors to design their own chassis at affordable cost – a price cap of £1,000 per car was set for the opening season. The book recognises that it was not a Lotus monopoly, far from it, and after putting the formula into context with alternatives of the time, notably the short-lived Formula 4, introduces many of the other manufacturers starting with Alexis, Beattie, Crosslé and Dulon and so on before moving on to the Lotus involvement. Precursors to the first Lotus FF models, the F Junior 22 and F3 type 31 are described before the FF models themselves, types 31, 51, 61, 59 and 69F, are covered in detail with Lotus production figures also listed. As well as the car constructors, several companies supplied the market with major components, notably chassis specialists Arch Motors and bodywork suppliers Specialised Mouldings and a chapter is devoted to these important contributors. The Ford cross-flow and its predecessor engines and the Renault and Hewland gearboxes which played essential parts are naturally covered in detail with many exploded diagrams as well as photographs. Throughout the book, there is also plenty to hold the interest of those not perhaps concerned with this level of detail. A nostalgic sense of period is conveyed by contemporary articles covering model descriptions, track tests and news items but most of all by the contemporary advertisements which are reproduced, many offering cars for sale at prices to bring tears to the eyes. The foreword is written by Ray Allen, winner of the first ever formula Ford race, and he recounts his career, culminating in F1, later in the book. As with the other books in this series, the production quality is remarkably high, the photos and illustrations being well produced on heavy weight (135gsm) glossy paper. 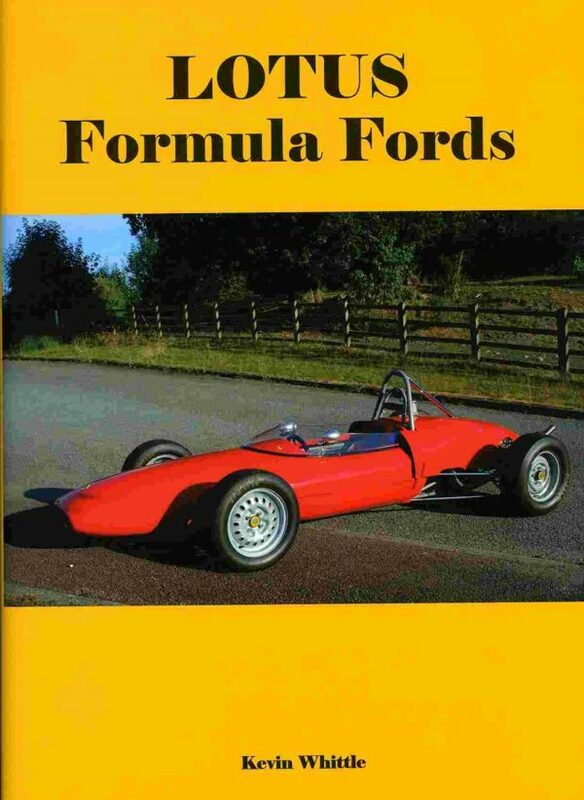 Both for this and for the information it contains, the book is excellent value and will surely appeal to anyone interested in Formula Ford, Lotus or the period when it all started. Price: £50 (signed by the author and numbered in an edition of 250). Description: Hardback with dust cover (12 by 8½in), 240 pages with 87 illustrations and 159 photos.